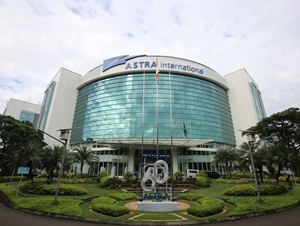 PT Astra International Tbk - Astra International (IDX : ASII) known as "Astra Group" is the largest business group in Indonesia with diverse category portfolios. Based in Jakarta, Astra Group has strong business competencies in automotive, financial services, heavy equipment and mining, agribusiness, infrastructure and logistics, information technology, and property. The Company was first established in 1957 and initially registered as a trading company named PT Astra International Inc. Later in 1990, the Company conducted its Initial Public Offering (IPO) and the name of the Company changed to PT Astra International Tbk. The Company's shares are traded under stock code ASII. PT Astra International Tbk is majority owned by Jardine Cycle & Carriage of Singapore (JC&C) which in turn is majority owned by the Jardine Matheson Group. As of December 2016, Jardine Cycle & Carriage of Singapore has a 50.11% interest in Astra Group. Other remaining interest in Astra Group was owned by general public and investors. Astra Group conducted business operations in all parts of Indonesia under the management of more than 200 subsidiaries, joint ventures and associates, and served by more than 200,000 employees. In the first half of 2017 (1H 2017, ended in 30 June 2017), the performance of Astra Group is showing good results. According to PT Astra International Tbk 2017 first half financial statements as cited by JobsCDC.com, Astra Group booked total revenue of Rp98,031 billion in 1H 2017. This reflected an 11% increase from Rp88,208 billion in the same period previous year (1H 2016). In 1H 2017, total net income achieved Rp9,357 billion, that was 31% higher than Rp7,116 billion total net income in 1H 2016. Minimal education background in D3, majoring in Accounting. Work experience: 0 - 2 years. Willing to be placed in Sunter Jakarta. Have a passion to serve. Able to communicate well with all classes. Have a high desire to learn and explore new things. Previous experience in the HRD section will be an advantage. JobsCDC.com now available on android device. Download now on Google Play here. Please be aware of recruitment fraud. The entire stage of this selection process is free of charge. PT Astra International Tbk - D3 Fresh Graduate Administration Staff Astra Group October 2017 will never ask for fees or upfront payments for any purposes during the recruitment process such as transportation and accommodation.